You know the 80/20 rule, right? It applies to just about every organization regardless of type. How do we do we break through that 20% barrier? 1) Don’t think about percentages. 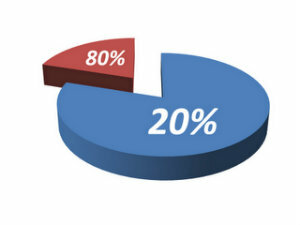 For the sake of simplicity, let’s say your 80% is actually 80 people and your 20% is 20 people. You could improve your percentages by alienating 10 of the 80 less engaged people, causing them to leave. Not a very good plan, right? And let’s say you implemented a new strategy that doubled the more engaged people from 20 to 40 and tripled the less engaged people from 80 to 240, dropping the percentage of more engaged people to 14%. Is that a bad thing? No. You see, the percentages don’t matter. What’s important is growing the number of people who are more engaged with your organizations. In How to Develop a Communications Strategy – with 6 Words we discussed the importance of creating a communications strategy by first asking “Why” (the purposes of our communications) and then asking “Who.” (Who are we communicating with, demographics, psychographics, preferred communications platforms). If 20% of the people are contributing 80% of the money, time, etc, and we want to increase the number of highly engaged people in that 20% category, we need to further segment our “whos.” We need better understand the 80% – who they are, what they think about, what they need, what communications platforms they’re using. Then we need to develop a strategy designed to move people in the 80% to the 20%. We also need to think specifically about 20%. Who are they? What are their concerns? What do they need? And are there other even higher levels of engagement we can help move them to? What can you do to move more of the 20% to the 10%, 5% or 1% of people who make up your fanatical core who would do almost anything to support your cause? What do you think about the value of segmenting your target audiences and communications by levels of engagement? Are you already doing that? If so, what has the effect been? If not, are you considering it? P.S. If you haven’t done the Communications Strategy Survey yet, please take 2 minutes to help us help you. Thanks! Interesting. Great points. It is amazing how applicable the 80/20 rule is to so many things in life! True. Thx for the comment, Dr. Murray. Love it, I've heard the 8o/20 rules on so many levels, like give 80 ask 20. Thanks for the greaet post… Now its time for the 70/30 rule. Well. from my experience the best way to get more from the 20% is to segment deeper. Even within the 20% you have the 80/20 rule, so if you are digging deeper into the 80% you will find the same. Do this 3 times into the remaining 80% and take a close look to each 20% group and focus on these customers and you will get better results from them. Exactly, Hansjörg! The key is to get to know your "whos" as well as you possibly can, and have strategies to help each segment take the next step towards greater engagement. When my church was young and we had to do everything through extra work and sacrifice, it felt (I didn't actually count, so I could be wrong) like 50% or more of the people were highly engaged. I wonder if part of this is also how needed people feel. If I feel like there's an important mission to accomplish and there aren't enough people to do it, I'm more likely to help out than if it's either unimportant or that there are more than enough people to do it. Casting that vision comes down to leadership. My pastor is great at saying "you're really, really needed" and "what we're doing is very, very important." I think that helps a lot. Paul, that's an excellent point. I would caution against assuming that's what motivates people, and go through the process of talking with people and learning first hand about them and what motivates them. But generally speaking, people want to be a meaningful part of something that's bigger than themselves. So regularly casting vision and communicating opportunities to be a big part of bringing that vision into being is usually a very important part of helping people move towards increased engagement. Well said. I continue to be amazed as to how this law manifests in all areas of life. I like your idea of changing up the numbers. That is where talent and grace meet business. When I was somewhat younger, and I had to do cold calling over the phone to earn my living, the 80/20 divide kept me going, because I knew that for every 100 phone calls I made I would get 20 yes's. A schlepp, but one has got to eat. It is amazing how God always has a solution for these issues. He does so in Ephesians 4:11-16, and the results of research since 1989, show that the 80/20 effect is reduced to a negligible amount, because what has been placed in peoples heart by God, can be identified and expressed. The detail of my biblesolutions website is hosted at Our Church, and I am sure Paul would be glad to supply the website path for those wanting to explore what I am saying. Interesting approach and i like the idea of breaking the rule. Thanks!